BLUE. Again. 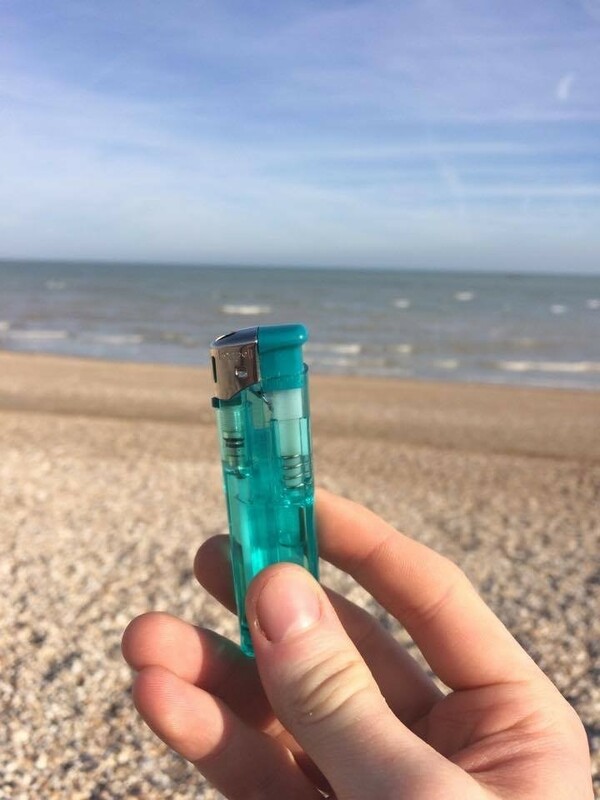 Another blue lighter. No, I don’t have an obsession with that colour. It’s not even my favourite colour. The truth is (and it’s an amazing truth as well) the reason for the blue lighter is a little similar to the reason for the last blue lighter I used: there was something that was near me that was blue. Genius! In this case, it was three things. No, they weren’t bald and painted or playing the drums – you’re thinking of my last article. These three things are all blue and aqua-related: the sea at Bognor Regis, the sky at Bognor Regis (why was I here? I’ll give you a hint… it begins with B), and lastly, my new dog Max at Bognor Regis. Obviously my dog isn’t blue, but… his lead is. How is he aqua related? Well, he drinks a lot. He’d make a good fountain, given the speed water passes through him. We took Max here to experience the sea. He’s a young puppy, only nine months old, and this was the first time he had seen a beach (to our knowledge). I didn’t just think ‘screw it, I’m gonna take my dog to Bognor’. If it was just a beach we were after, then Brighton is closer to me. Part of the reason why we took him here is because one set of my grandparents lives in Bognor. When I was younger, I had another dog, Ben, who loved seeing them as much as I did. My granddad Jim always showed him far too much attention, and now we wanted to show off Max to them as well. Ben, bless him, was a bit of an idiot (similar to me in several regards) and he would ALWAYS slobber on you. Max is nothing like that. At worst, he dribbles when he’s had something to drink. But then again, all young things do. Dogs and humans are alike in that regard. Ben used to love going for walks on the beachside. He always barked at the waves when they hit the coast and jumped around in them. It has been five years since Ben passed. We didn’t get Max solely to replace him – he’s also there to provide companionship to our other dog, Mazzy, a Sprollie just like him. We bought her back when we had Ben. Now Max has assumed Mazzy’s old role: keeping the elder dog company when we’re not in the house, and to help us if (and when) the older dog passes on. It’s one of the hardest things I’ve been through, worse in some ways than losing a grandparent or another family member, because pets are in your house 24/7. Because of their shorter lives, I try to bond with them as often as I can. Dog walking is one of my favourite pastimes. It helps me to clear my head and ponder on things that I can’t ponder on indoors. With both of my dogs being Sprollies (half Collie, half Springer Spaniel), they need to expend a lot of energy, so every weekend, we take them for a long walk. Walking down the beaches is a good way to keep them exercised and entertained. If you don’t own a dog, you’re missing out (unless you are allergic, or a cat nut. Freaks! (this is coming from someone who owns two cats as well…. I’m a hypocrite, deal with it.)). It’s an absolute joy having them in the house. Seeing them wag their tails when you’ve had a bad day is a failsafe way to make you feel better. In many ways, dogs are like lighters. They warm you up, they are the light in my life, and when the world runs out of lighters, I’ll be keeping a dog close to me to help me through the long nights.